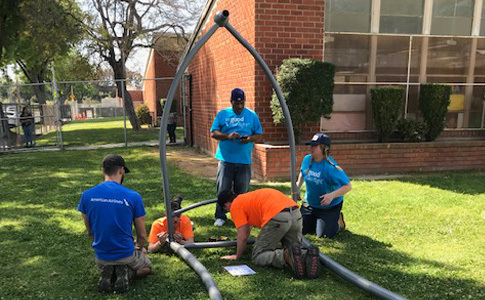 American team members spent the day constructing new playground equipment at Bennett-Kew Elementary School in Inglewood. Since Vollon Dixon's family moved to Inglewood, California, in 1964, he has seen a lot of changes in the neighborhood. When his parents purchased their home, which the family still owns today, they were the first African Americans on their street. Soon, Inglewood will undergo additional changes, as the Los Angeles Stadium and Entertainment District is set to open there in 2020 and become home to the Los Angeles Rams and Chargers football teams. Last week, a group of 50 team member volunteers from American and the Rams followed the direction of Carter Oosterhouse from Carter's Kids to construct a 1,500-plus-square-foot playground at Bennett-Kew designed for children ages 5 to 12. After the ribbon was cut, the community began enjoying the new facility, which features climbing walls, ladders, slides and more. Flight Service Duty Manager Alexis Contreras, who has lived her whole life in Inglewood, couldn't wait to see the finished product. Kevin Demoff, President of the Los Angeles Rams, was joined by team mascot, Rampage, to cut the ribbon. Kevin and Rampage were joined by Suzanne Boda, Senior Vice President, Los Angeles, at the ceremony.